Summertime care for Knockout Roses. – Johntheplantman's stories, musings, and gardening. 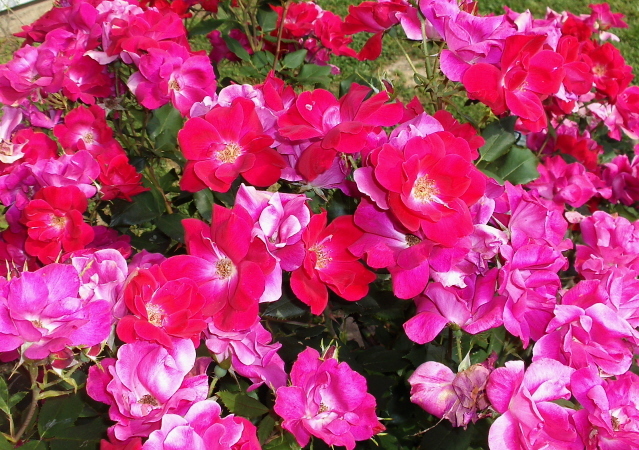 Posted byJohn P.Schulz	 June 2, 2013 May 26, 2014 5 Comments on Summertime care for Knockout Roses. Knockout Roses and summertime maintenance. 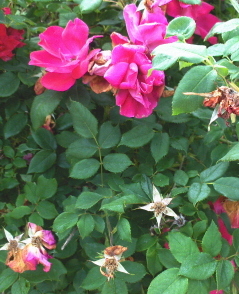 Beautiful flowers on a Knockout rose, but the spring flush is starting to fade. After over 30 years as a landscaper and plant grower, I have learned that there is no such thing as “no maintenance”, only “low maintenance.” The Knockout rose is definitely in the low maintenance category. After the first beautiful flush of bloom, the plant begins to fade. This is because the first blooms have been pollinated and the plant is busy with its inherited job of making seeds. This shows up as dead blooms and an overall dropping of the early spring petals. The seed pods develop and the petals fall. Here’s what is going on. The flowers have been pollinated and are in the process of making seed pods. There is a chemical produced in the plant that slows down the next blooms so that the seed pods can mature. In order to fool the plant that it needs to make more flowers, the seed pods must be removed. This is called “deadheading.” All serious flower growers know about deadheading and I talked to Judy about her Knockout roses the other day about it. Judy said that cutting off each spent bloom took a lot of time and trouble. It started me thinking about the best way to accomplish the job. 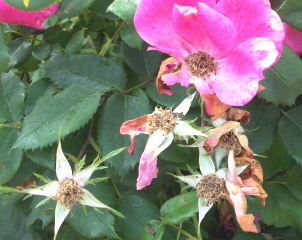 My feeling on the deadheading job on the roses (and the way I do it on the job) is to combine the job of deadheading and cosmetic pruning into one operation. I start by looking down into the plant to isolate the stems which have mostly spent blooms. 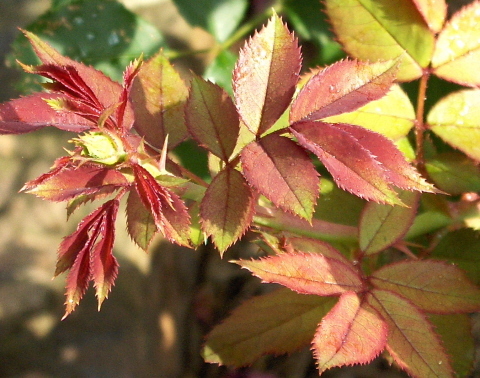 Careful pruning and deadheading will produce new growth like this–with lots of flowers. If I reach inside the plant and cut the stem (directly above a new leaf node) I can not only get the plant deadheaded in less time but also cause the stem to branch out and make even more flowers than before. You may read about some of the principles of pruning in this article on “how to prune a jade plant.” The principle is the same. I carefully cut a stem in a manner that performs two tasks. Here is what I cut. 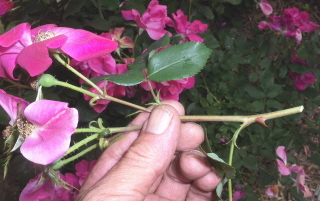 deadheading and pruning the Knockout rose at the same time. The process is really rather simple and you probably won’t mess up. You can cut the stem short and get more branching at the top of the plant or you may wish to take out a larger cutting which will let more light inside the plant and increase the later flowering even more. You may wish to try deadheading on all of your flowers, especially marigolds and petunias. It does make a difference in the number of flowers you will get. An application of a high phosphorous plant food or fertilizer will also help the plant to flourish and produce even more flowers. Maybe use something with an analysis of 15-30-15 or a similar ratio. Liquid feeds are fine and it doesn’t hurt to pour it all over the leaves as well as around the roots. The upside for liquid is that it works faster. The downside is that it doesn’t last as long. 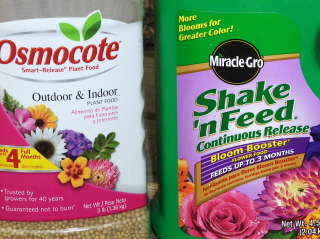 Time release fertilizers such as Shake ‘n Feed or Osmocote will work well and last the entire season. You need to scratch these into the soil or pour them into a small trench around the plant for full effect. Every now and then you may get fungus on the roses, and sometimes aphids will set in. I suggest a combination fungicide/insecticide which you can purchase at any good nursery . Welcome back to blogging. 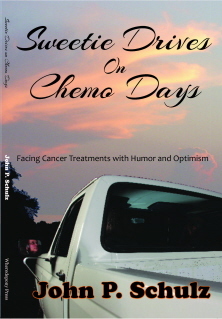 Looking forward to reading more from you John! Hey John, keep up the good works! You are a good fighter. My knockout roses are doing great in my PART SHADE. The hybrid teas don’t like it. ha. Glad Johntheplantman is back in the saddle again. I’ve missed these posts. Pingback: A Small, Private Back Yard With Tea Olive and Roses | Johntheplantman's stories, musings, and gardening. Pingback: February Jobs For the Winter-Weary Gardener | Johntheplantman's stories, musings, and gardening.